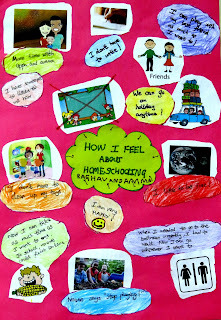 He also wanted to make a poster for the launch - about his homeschooling experience. We mapped out all the feelings and points and then he looked up Google images to search for appropriate visuals. He then cut them all out and stuck them on to make the poster....and this is the first time he has written so much in one day - I guess because the thought and idea came from him! The poster actually brings out the little things that adults take for granted in the schooling system, that could be huge problems or issues for kids to handle day after day, till they reach a breakdown point. What a joy it is to see him through these years of experimenting & self-discovery. I'm not surprised at all at his insights after hearing him casually declare his fears in the playground the other day. That's totally happy acceptance of self & such healthy self-worth in action. Way to go Raghav! I do also want to know- what does he not like about homeschooling if there's such a thing? Choosing books - a state of being?